***WINNER ANNOUNCED*** Congratulations Vicki H! 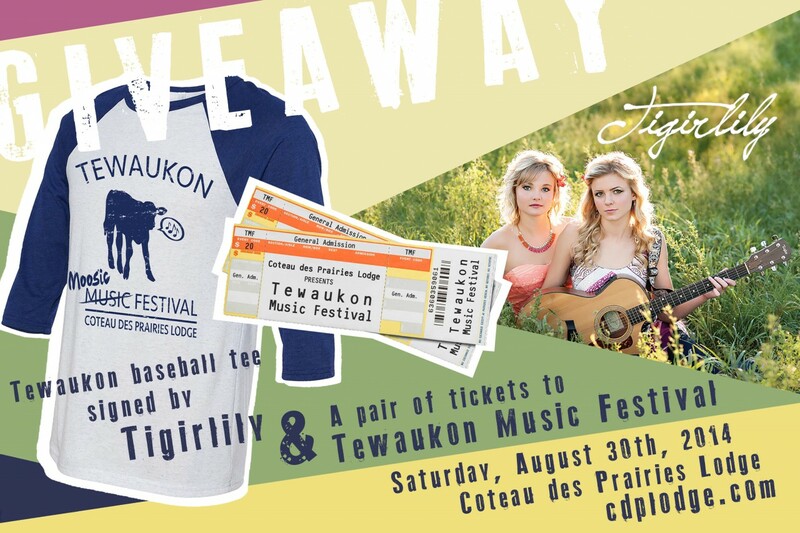 Here is another chance to win a pair of tickets to the FIRST EVER Tewaukon Music Festival and our limited edition Tewaukon Music Festival baseball tee…signed by Tigirlily! This is easy peasy. Enter to win by sharing this contest on Facebook or Twitter! You can use the buttons below. The more shares, the more entries you get! For another easy entry, let us know what you think about this whole crazy Tewaukon Music Festival thingy in the comments section below. We will announce a winner on the morning of Saturday, August 9th. Keep your fingers crossed and keep humming Tigirlily tunes. I think this whole crazy thing is a great idea! Party on the Prairie! I think it sounds like a super fun time! I hope you pick me!! Wonderful idea. Thanks for bringing people and good music together! Wonderful! Where and when can we purchase tickets? What better place to party but at the lodge!